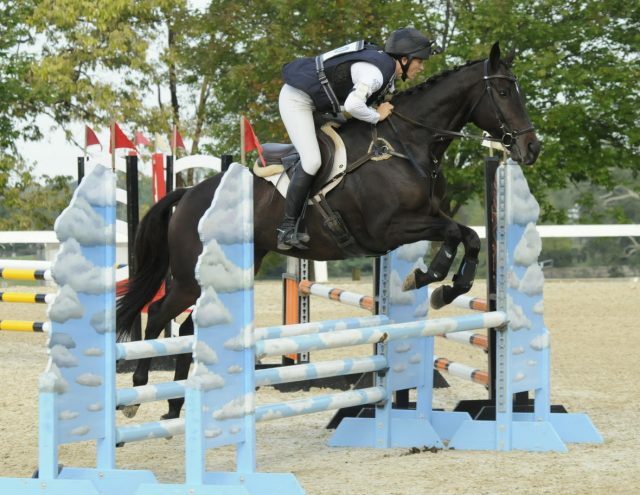 Elisa Wallace and Reloaded in show jumping. Photo by GRC Photo. Elisa has come close to winning the top award several times, which made this year’s honor extra sweet. “America’s Most Wanted Thoroughbred” is a fan’s choice award, so to speak, and at the end of the day fans came out in droves to cast their votes for the 2013 15.3-hand bay gelding (Magna Graduate x Curious Cat, by Tale Of The Cat) owned by Michelle Chisholm. Bred in Kentucky by Elisabeth H. Alexander, Reloaded won $20,177 in 19 racing starts. Reloaded and Elisa Wallace, winners of America’s Most Wanted Thoroughbred, accepting their $10,000 prize check. Photo by Anne Litz. Michelle also owned Elisa’s 2017 Makeover mount Sir Teddy. Kelly Lupton found the horse at the racetrack and Michelle bought him in September 2017 via reseller Jessica Redman. He had a few months off and went to Wallace in December, and then did his first recognized Beginner Novice event after just nine off-track rides. “Basically my daughter fell in love with [Elisa and Simply Priceless], and I said I want to see this whole process happen, how you bring one off the track. And Elisa is who I called,” Michelle says. 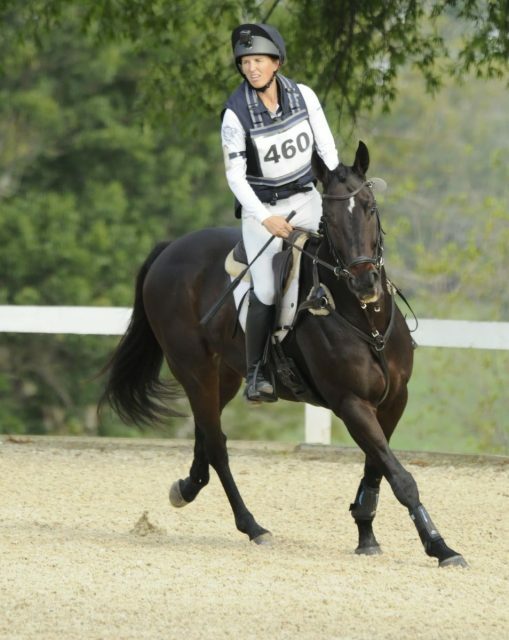 Elisa is a longtime advocate for the Thoroughbred breed — in addition to competing Simply Priceless through the four-star level, she’s made time in her schedule to attend the Thoroughbred Makeover every year since she was first asked to judge the Freestyle division in 2015. “I was like ‘Oh no, I need to do this!’ ” she recalls. Elisa Wallace and Reloaded. Photo by GRC Photo. 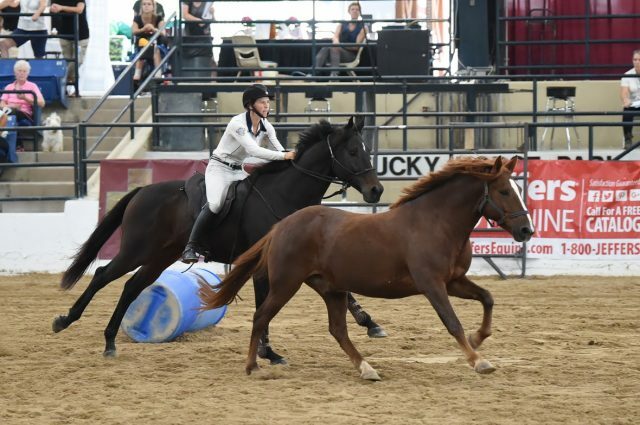 Since their first Beginner Novice event in December of last year, Elisa and Reloaded have completed six Novice events together with nary a jump penalty on their record winning two and picking up a couple blue ribbons along the way. Check out this cross country helmet cam video of the pair competing in Open Novice at Stable View last weekend, and here’s a between-the-ears view of their Finale performance yesterday. Elisa and Reloaded also competed in the Freestyle division, where they finished 17th. Their routine included liberty work and also incorporated one of Wallace’s mustangs, Fledge. Elisa Wallace and Reloaded in the Freestyle. Photo by GRC Photo. Congrats, Elisa and Reloaded! 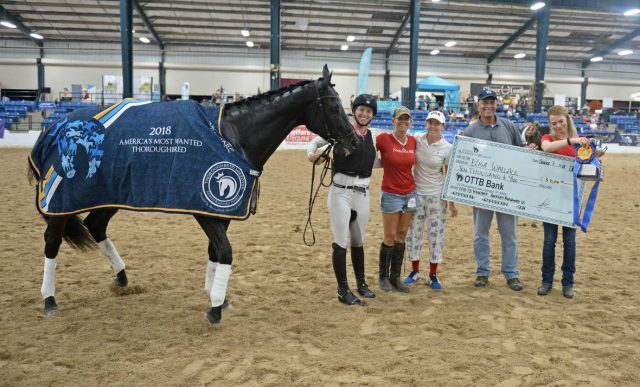 For full results from the 2018 Thoroughbred Makeover, click here.